I am trying to retain as many of the factory features as possible but finding info on the navigation/10-speaker units seems to be nearly impossible! I found some wiring diagrams via Autozone and I was able to make my own pinout charts. I'm not quite sure what everything does but I think I have found most of the important stuff. I will be probing around in the car to confirm sometime this week. I was hoping that someone could help fill in the blanks. Ideally when I am done the van will still look stock but now have a new Pioneer deck with Carplay in place of the stock unit. I will be able to send AUX/video in from the stock AUX jack on the dash, and maybe even send video out from the HU to the rear entertainment. I will retain the stock backup camera. The plan is to use the PAC RadioPro4 to interface with the JBL amp such that the pioneer deck will talk to the JBL amp which will in turn drive the 10 speakers. I have all the wiring for that figured out as most of it is pre-terminated. For the backup camera I believe I have the right connectors and pins so I can send 6v to the camera and grab the composite video signal and feed it into the pioneer HU. I bought an adaptor so I don't have to chop up the factory harness. This will be connected to the reverse wire to trigger the head unit and camera power. 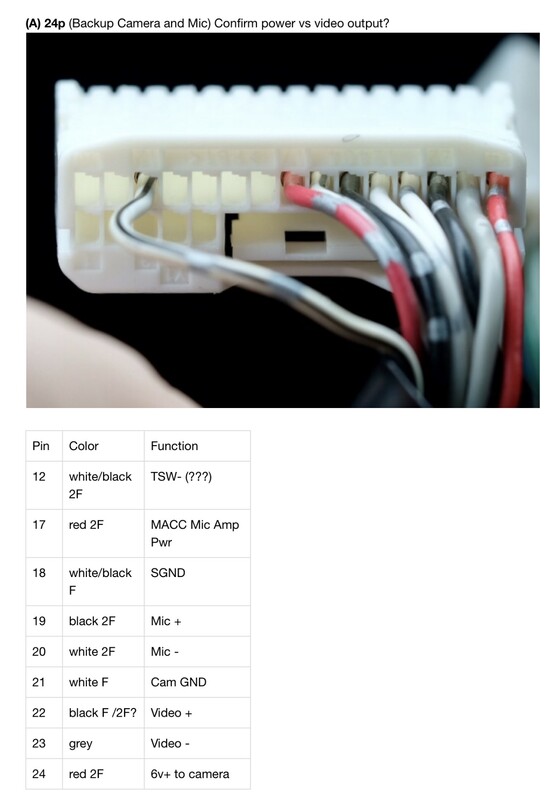 I think the dash mounted AUX input might have audio and video input as the Blue connector (B) has a video wire on it. If so I could wire this directly into a 1/8" connector and into the rear of the pioneer allowing the existing AUX to send video/audio directly to the pioneer. I'm not sure exactly what the black connector does but I'm guessing it sends audio from the head unit to the rear entertainment system. I'm not sure if this is line level or amplified. The PAC interface will only use the front speaker outputs on the HU to send L/R audio to the JBL amp. It has rear speaker outputs and rear RCA outputs available. However, if it is an input from the rear entertainment into the head unit as an audio source then I will definitely want to grab that and use it as an input into the HU. I will be replacing one of the two 12v outlets with a dual USB connector. One end will be connected to the HU for CarPlay, one end will be connected to a car charger. A micro-bypass will connect to the parking brake to unlock the Pioneer features like settings while in motion. Any info you guys have would be greatly appreciated. 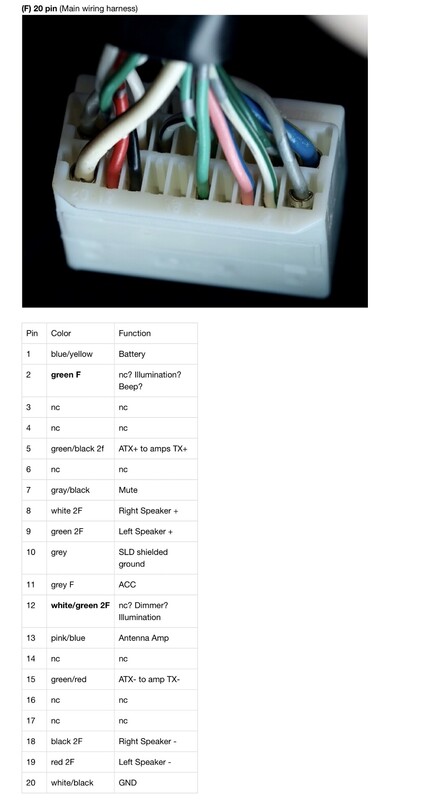 I plan on compiling my collected info into a solid wiring diagram for others to follow. Last edited by pcmofo; 08-14-2018 at 09:12 AM. Probed F2 to confirm it is the Illumination wire. B1,4 are NTSC video inputs from the DVD? to the DVD? The entire E connector, I suspect it is pushing audio from the DVD to the HU so it can be sent through the car speakers? I was able to use B1, B4 and the E connector to get audio and video from the rear DVD player into the new head unit. The video and audio had interference so I'm sure they are hooked up incorrectly. All 3 signals have a positive, negative, and ground. I still need to figure that out. Everything else worked perfectly and I was able to talk to the JBL amp and 10-speaker system using the PAC RadioPro4, retain the backup camera and steering wheel controls! Thank you for this write up. 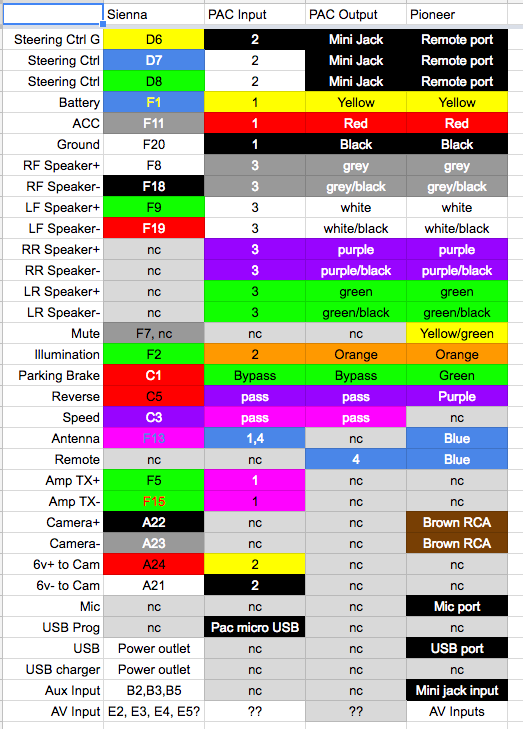 I'm in the exact same boat (2006 Limited), but working with some different components (idatalink maestro vs pac, and likely a different head unit). Please let me know if you know about the aux input and if it carries a video signal as well as stereo audio. I've got some resources collected on the various pins in the system, but you're probably ahead of anything I've gotten by piecemeal. One missing part which I think could be helpful is a pin diagram of the plug that goes into the RSE (rear seat entertainment) system / display. That way it would be easier to see where the aux inputs are coming in, and the outputs for AV are going out to the head unit (that's how I understand it's supposed to work). You can use the Aux for Audio only. It pops out pretty easy but has no video connector. It is a part that fails often so many people re-solder it or fix it up. It would be not too bad to gut it and throw in a AV extension cable glued in it's place. Personally I would put the AV input in the small upper glove box as the reason it fails is the connection is easy to bump and sticks out. I got my rear system going IN to the new head unit. It is possible to get the Output of the head unit into the rear display but like you said, you would need to run an AV cable from the back of the HU around the drivers side and to the AV inputs. This is the only way. I have not done this but I plan on connecting that to an HDMI->Composite adaptor so I can connect a Pi or Apple TV or something more exciting than the head unit can provide. You can use the factory bluetooth mic though I can't vouch for the quality or if you will have to send power to the amp section of the mic. It is also possible to remove the cover and simply insert the aftermarket mic in it's place. In my controller I can talk directly to the JBL amp to control the EQ as if I was the OEM HU and set the base and sub etc. I need a PC to do this though, the HU settings for bass etc are added on top of that, JBL is still controlling the tuning. I am working on a video of my install and I also have a complete wiring codes and other spec sheets I will post later. In an unrelated note, I just finished replacing both door cables and door jamb motors. Got a few more things to tweak and it will be running like new. Good point on the Aux. 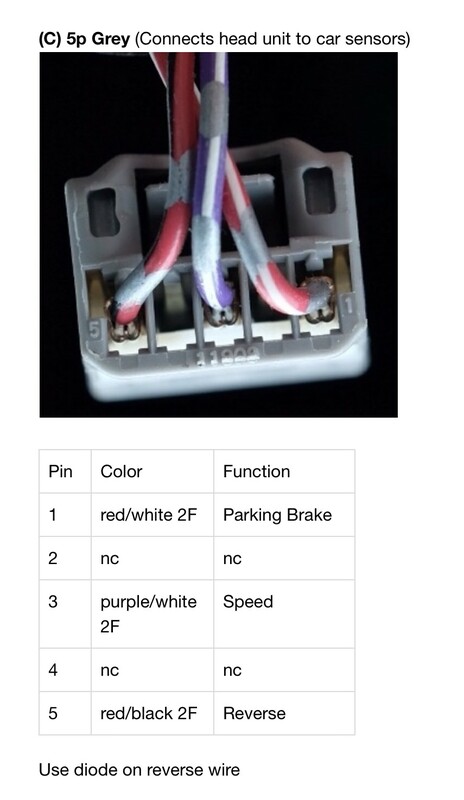 I bought an Composite AV spitter that would let me split audio input from the factory aux port and also run Red White Yellow inputs to my glovebox. I'll likely hook that up now that I know the factory aux port doesn't support video. I can't think of a reason I'd want to feed DVD video from my RSE system to my HU. What scenario are you planning to use this feature? What I was thinking however is that you could use the existing OUTPUT wires that go from RSE to HU, and cut them and splice them into the INPUT wires at the RSE plug. Then you'd have the option of auxiliary input from the HU, or from the 3rd row video terminal without needing to run new wires. Do you think that would work, and did you figure out why you were getting interference when hooking up the RSE AV output as in input into your HU? I'd hate to go through the effort if it just won't work. The Pi Zero W has Composite Video Output terminals. It's not the strongest device, but I believe it can run Kodi, and it has built in wifi and bluetooth. You can configure it to be a hotspot and share local files (on MicroSD or USB) to all riders in the car. You'd need a USB DAC, or dedicated hat however to get analog audio output. https://www.raspberrypi.org/magpi/rca-pi-zero/. Anyway it's small size might make it easy to tuck away inside a panel in the van. I can control lots of EQ settings from my JVC KW-M730BT HU, I can increase the overall bass and the amp gain as well. It's only the subwoofer I can't bump up on it's own. My HU does have dedicated subwoofer line outputs, but they are not connected to anything. I don't understand the systems involved enough to know if I can do anything with those to gain dedicated subwoofer controls. Are you able to set multiple actions (short press & long press) for all of your steering wheel buttons? I believe when I looked into the PAC a few reviewers on Amazon said there was odd fading happening to some of the speakers. I don't like that the iDataLink has to be programmed by a PC (can't do it from my Mac), and completely pulled out of the vehicle if it needs to be reprogrammed (for example if I ever wanted to reset it or map my buttons differently). I wonder if I could leave the mini USB cabled connected and reprogram it while the van is off (even with all van cables plugged in). Looking forward to your video and docs! On the doors, I need do replace the rear bracket with the rolling mechanism before my motors and cables suffer damage. That part is almost $300 as far as I know and I doubt the repair is a trivial DIY project. Did you have to replace that component at all? The symptom is that my sliding door on the drivers side is noticeably sagging and is starting to not close all the way on it's own, or open very easily when pulling the handle (have to tug harder). You can either go HU->RSE or you can go RSE->HU, The wiring already exists to go RSE->HU and in the rear there is already a power outlet and composite input which would be easy to plug in a Pi, Apple TV etc so you have HDMI device -> HDMI/Composite converter -> Composite input to RSE -> RSE -> HU meaning that the rear seat could watch something and the HU could selectively chose to watch it or do other things like navigation. The HU I have can't do dual output so the front and rear are doing different things. I could see that HU->RSE could be useful if you wanted a phone to use an app directly into the HU for example. My interference went away when I soldered and secured all the wires. I think the test probes and unshielded cables were causing the issues. Yep, there are lots of ways to do this. $30 gets you a HDMI to Composite adaptor, I was considering replacing the composite inputs with an adaptor and a HDMI port instead. Yes I can send short/long press with the PAC. I haven't needed to use them but it does do it. The PAC talks directly to the JBL amp to control the EQ but does not talk directly to the stereo in the same way the Maestro does so ANY EQ type settings done on the HU are done to the signal being sent out to the front speakers and into the JBL Amp input that is then applying its own EQ settings. I taped a USB cable to my PAC unit then jammed it deep into the dash. The trim panels of the sienna pop off easy and the male end sits right there. Many issues of the PAC unit are due to needing to connect it then disable the auto fade option in the software. If you don't do this you get bad things happening like no audio from the rear, only the front and sub. After it works as expected. Fade has to be set in software along will all other EQ settings. I replaced the cables with a kit from amazon. Watched several videos and it still took over 8hr to do both doors. I also replaced the door popping motors that pop out the door before it is opened. And while I was doing that I replaced the upper sliding hinge which is what I think you are talking about. I wasn't planning on doing this but the bearing exploded causing the door to jam all the time even when I had disabled the auto sliding. I bought them from amazon for $107 each, painted them to match, and installed them at the same time since I was touching all of those parts anyway. Doing just the hinges is super easy and would only take maybe 30 min each. 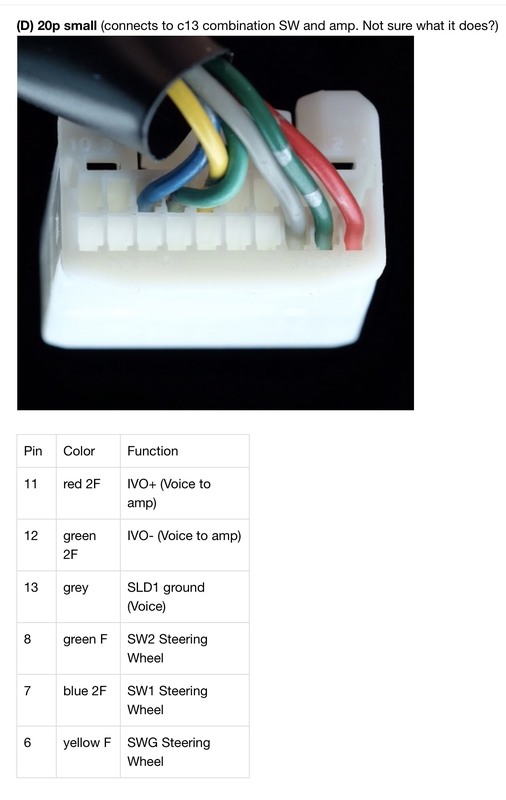 I know that's the way the wiring works currently, and I believe your new HU has 2 inputs for audio. My new HU only has a single 3.5mm input for AV. 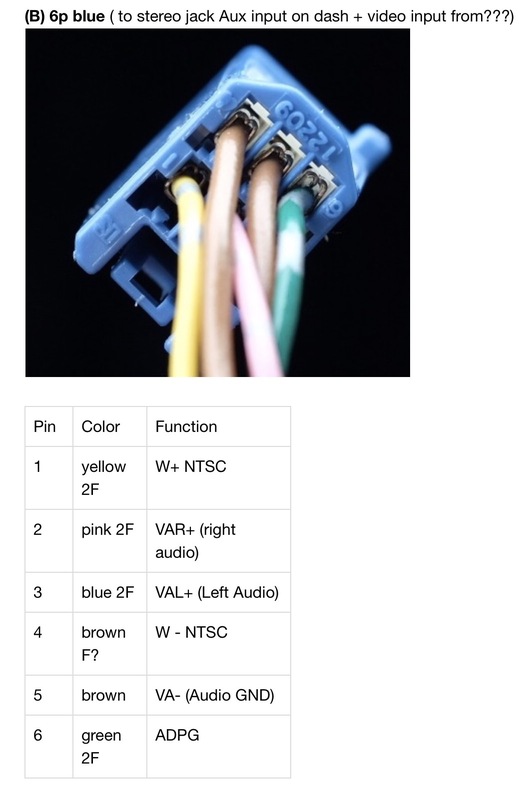 I can choose to use it for connecting external devices (iPod, DVD player, etc) or I could wire the output from the RSE to it (RSE->HU). Having a dual-zone HU, I can load a movie off a USB drive and send it to the RSE (HU->RSE) via the 3rd row video input terminal. But I was thinking I might also be able to do this using the existing wiring that goes RSE->HU and splice it into the video input terminal wires at the RSE plug. That would basically give the RSE 2 input sources as opposed to 1 input & 1 output. when I want an external video source. I'll have to check my HU documentation to see what the dual-zone system allows to play nice together. For example I can output USB, but then I'm not allowed to input CarPlay audio from my iPhone (only AUX). I'm hoping I could output analog AV and still be able to input CarPlay or USB. The benefit of a setup like this (fancy/hacky one) would also be that I could play any external source over the van speakers. Or I could just run a 3.5mm male to male from the RSE headphone jack to the aux input and be able to do that too Decisions decisions. It is possible to use the HU to RSE wires in reverse. You would want to remove the RSE from the ceiling and seeing if you can easily solder into those inputs or harness. A basic continuity test should prove that the HU is directly connected to the RSE where you expect. Since it is composite you could most likely test with alligator clips etc. My budget for this project was about $100... I sold the existing HU which paid for nearly all of the new parts I needed including the CarPlay HU. I had no idea the PAC adaptor would be so expensive and integral to everything working. If I had kids that were older I might have gone with a better HU, ran HDMI to the rear, wireless CarPlay etc but I don't need those things now. It's good to have the option though. And I'd I cut/splice those into RCA connectors to go into my splitter, and into my 3.5mm AV input jack on the new HU. If I set it up like this and I send AV from a composite source into my HU, then HU -> RSE via 3rd row inputs, that AV would then make a full loop back to the HU (3rd party device -> HU -> RSE -> HU). Does that loop present a problem? The reason I might want this setup as you mentioned, is I could use a more modern device like a Pi 3 (which I recently discovered has AV output through it's 3.5mm port.. I previously thought it was audio only.. but good that you wouldn't need an HDMI adapter) and play it's audio on the car speakers. Or I could use an older device like a video iPod to let the wife pick movies for the kids from the front seat (to be sent to the back with audio going to headphones) while I'm still CarPlaying from my iPhone over the van speakers. I think this would max out the scenarios I can potentially use. Yep that should work for you. You should not experience a problem with the loop unless you do... Car audio is strange sometimes and you will know if you have a ground loop or other problem pretty quickly. Also, converting, splitting, and sending that analog signal around may degrade the signal by the time it reaches you again. Good luck though! I still have to pick up some IR headphone from ebay. Very nice! I wish this video was up when I did the install. I spent a lot of time researching. I was having some issues with Carplay failing on my HU that I tracked down to bad USB cables. I got something more similar to what you installed in the video and am crossing my fingers that it continues to work as well as it did on the trial run tonight. Will Auxillary video (connected to the 3rd row jacks) be passed to the HU? or only DVD audio/video? Do the DVD AV output wires always send a signal to the HU, even when wireless headphones are in use? Good questions. I haven't tested either but I assume that the RES input would also forward to the front. My plan was to put a small video player there and a HDMI to RCA converter and not actually use the DVD. No idea about the headphones as I don't have them. If you figure either of these out let me know! Will do. If you can confirm that the RSE (aux inputs) forward to the HU please post back.